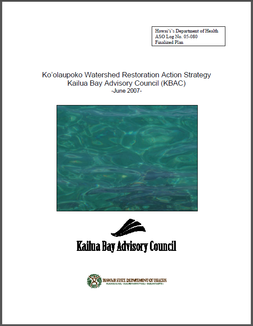 education and outreach in the Ko’olaupoko area of windward O’ahu, Hawai‘i. The WRAS integrates the Environmental Protection Agency (EPA) nine-priority elements to assess watershed health. As an approved WRAS, projects identified within the plan are given priority consideration (to the extent practical) for funding under the State’s 319(h) program established pursuant to the federal Clean Water Act. Low Impact Retrofit projects are defined as landscape features which use green infrastructure principles and ideas to manage storm water within a confined urban space. Low Impact Retrofits are intended to address NPS pollution by capturing and treating storm water on-site. The use of LIR can effectively reduce NPS pollution loading on receiving waters. Through this document, 220 sites were identified and ground-truthed, resulting in a total of 60 sites being ranked candidates for Low-Impact Retrofitting. 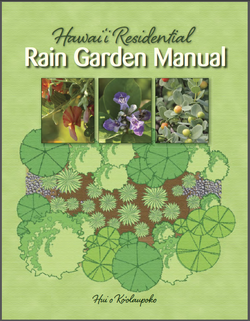 The purpose of the Hawai‘i Residential Rain Garden Manual is to teach residents of Hawai‘i the procedure of building a rain garden leading to the protection of Hawai‘i’s natural resources. Rain gardens have the ability to reduce the amount of pollution entering waterways by intercepting stormwater. Rain gardens are ‘designed with nature’ as they mimic natural processes by treating and infiltrating stormwater into the ground and evaporating it back into the air, much like undeveloped areas. The Manual will provide homeowners enough information to safely design and construct a rain garden based on historic rainfall patterns, soil properties and drainage areas. Additionally, this manual can easily transfer to schools or more developed urban areas to construct a rain garden. 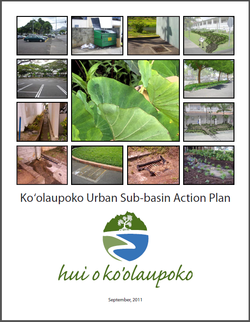 If, after reading this Manual, you are still unsure about how a rain garden should function, proper location or if your site is a good candidate for a rain garden, please contact Hui o Ko‘olaupoko.